Grab the output shaft of a PM DC motor with pliers (make sure it’s a small one!) and turn on the power. You will instantly feel the twisting force on the shaft as the energized windings try to attract the permanent magnets inside. If this was one of EcoSpeed’s motors you would feel several pounds (kg) of force trying to pull the pliers out of your hands. As long as you hold the shaft stationary, it is exerting a force but since there’s no shaft motion, there’s no power output. There’s plenty of electrical power going into the motor though. So, the efficiency which is defined as mechanical output power divided by electrical input power is at zero percent. Allow the shaft to turn slighly and it’s now producing mechanical power. Mechanical power is just twisting force (torque) mulitplied by shaft rotational speed (rpm). As the shaft slowly turns the the torque is about the same as when stationary but the motor is now producing a small amount of power. Efficiency is still very low, only a few percent, because electrical input power is the same. Now release the shaft and let the motor spin free. If you’ve taken a physics course, you may recall that not only does a current in a wire create a magnetic field, but a wire moving through a magnetic field creates a current in the wire. As the windings pass through the fields of the permanent magnets, a current is induced which opposes the current that the motor controller is supplying. This induced current increases linearly with rotational speed and at a certain speed the controller can no longer supply enough current to increase the motor speed any further. This is the peak speed of the motor. At this speed the motor is supplying only enough torque to overcome bearing drag and air resistance. There is none available to drive a load, so even though there’s very little electrical power going in, there’s also no mechanical power coming out. So, efficiency is again zero percent. In between the two extremes power and efficiency vary from zero to a peak and then back to zero again. If there were no controller, motor torque and winding current would be limited only by the winding resistance of the motor and the reverse current. Current would peak at zero rpm and decrease linearly until the motor reached its peak rpm. If you plotted current and torque against motor rpm, similar to Fig. 1, you would have a straight diagonal line from the upper left of the plot to the lower right. Such a motor would have tremendous starting torque but would be very inefficient. Efficiency wouldn’t go above 50% until half the peak motor speed and wouldn’t peak until about 80% of peak speed. Peak power would be produced at 50% efficiency, i.e. half the electrical power input would be wasted. To improve efficiency, all motor controllers are designed to limit the peak current that the motor can draw. By limiting current below a certain speed, efficiency is increased. Such a current limited motor can go above 70% efficiency well before half of peak rpm. Fig. 1 shows current plotted against rpm for a conventional current limited motor. A curve such as this would be representative of one of our motors operated by a conventional controller. Fig. 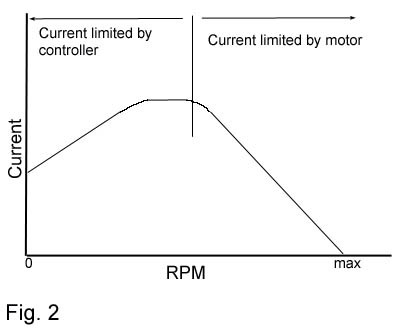 2. shows the shape of the current vs RPM curve for a motor using variable current limiting. The current is decreased with decreasing rpm below a certain point. This type of current limiting allows even higher efficiencies at the expense of somewhat lower low speed torque and also protects the controller from high stall currents for increased reliability. Because the EcoSpeed Mid-Drive system uses gears to boost torque, it can take advantage of the efficiency of this type of current limiting without losing significant performance. What this type of limiting does is increase average efficiency without affecting peak power, which occurs in the “Current limited by motor” portion of the plot. The EcoSpeed Velociraptor controller can take advantage of this type of current limiting.